Feed Sources are stored in your WordPress site as a custom post type, making it easier for you to import and export them at will. The process is, therefore, the same as if you were to import/export WordPress posts or pages. 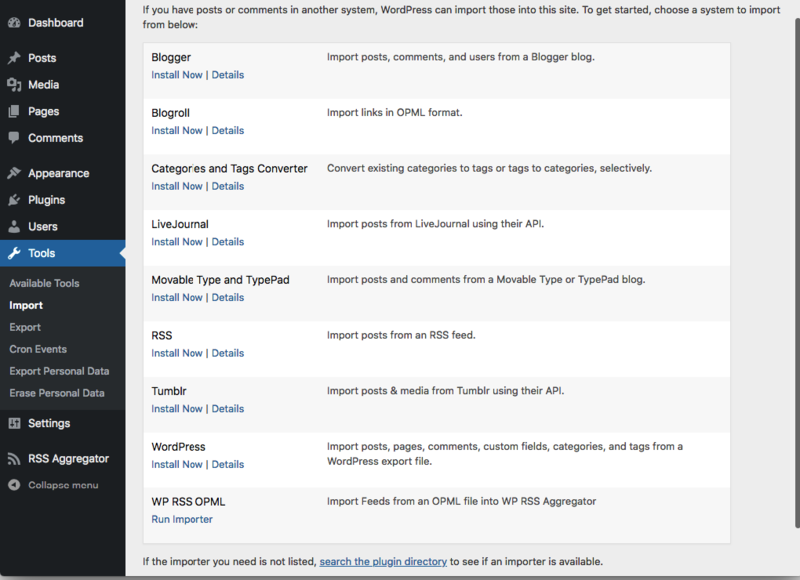 Navigate to Tools > Import in your WordPress dashboard and choose the WordPress Importer. If you haven’t installed it yet, you will be prompted to do so. Just follow the instructions provided. On the Import page, choose the file that you want to upload and import by clicking on Choose File, and then clicking on Upload File and Import. The feed sources will be imported and found in RSS Aggregator > Feed Sources. To export your feed sources to a file, such as to keep backups while running some tests or to migrate them to another site, simply navigate to Tools > Export in your WordPress dashboard, choose Feed Sources and click the Download Export File button. The file will now be downloaded and can be imported into any other WordPress site that has WP RSS Aggregator installed on it. Please note that if you are exporting from a site which uses our premium add-ons and re-importing the feed sources into a site with, for example, only the core plugin, the settings of the premium add-ons will not be available on the new site, as expected.